An adaptation of the exploits of characters created by Patrick O’Brian, who wrote twenty novels in the Master and Commander series, The Far Side of the World (which takes its name from one of O’Brian’s books but includes plot elements from several) differs from lighter entertainment centered around high-seas derring-do such as the Pirates of the Caribbean trilogy in the rigorous pains it takes to be technically and historically accurate. The specific adventure portrayed is not a true story, but it is set in the historical backdrop of the Napoleonic Wars, and the filmmakers did extensive research into warships of the time period. Australian director Peter Weir (Picnic At Hanging Rock, Witness, Dead Poets Society, The Truman Show) filmed an actual typhoon and blended the authentic footage into a scene in which the crew battles a storm at sea. What little special effects there are are blended into the real thing with indistinguishable versimilitude. It is 1805, and with Napoleon conquering Europe and threatening Great Britain, the HMS Surprise under Captain Jack Aubrey (Russell Crowe) is stationed off the east coast of Brazil with the mission of engaging and capturing or destroying the French warship Acheron, which is bigger, faster, has more guns, and is nearly impervious, and could help tip the scales in Napoleon’s favor if it is allowed to rampage unchecked through the Atlantic. The first engagement is a near-disaster, with the Acheron immediately turning the Surprise from hunter into the hunted, inflicting heavy damage and only losing the chase when the pursued British disappear in a fogbank. Time passes, during which the Surprise licks its wounds and we get to know the crew, principally ‘Lucky Jack’ and his closest friend onboard, the surgeon Stephen Maturin (Paul Bettany), as they deal with various problems including a typhoon, frigid cold, and a long period when the ship is stranded without wind to fill its sails, and the tension onboard mounts and threatens to boil over when they become convinced one of the officers is cursed. 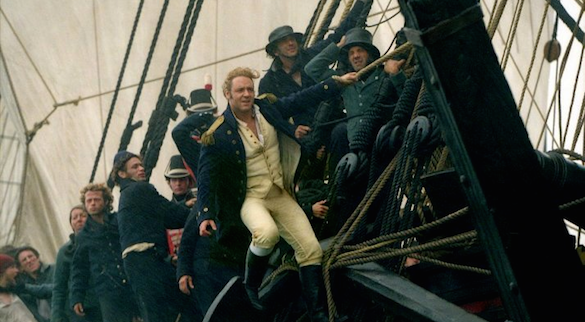 Master and Commander begins and ends with rousing action sequences, but the action is far between. In the meantime, the filmmakers concentrate on effective character-building, delving into the interactions between the members of the crew, and making a serious effort to give us an honest, unromanticized look at what it was actually like to live on a ship. The reality is not glamorous or particularly pleasant. The bowels of the ship are cramped, stuffy and dirty, and death is not painted as glorious or romantic. Master and Commander allows us to smell, taste, and feel the dirt, water, and blood (or at least as close as any movie can bring us). If one isn’t engaged in a battle, day-to-day life is monotonous and uncomfortable. Stephen and the officers live somewhat more comfortably than the men, but a ship offers limited options, and when it comes under the guns of the enemy, everyone is in harm’s way. The use of very young boys in combat may seem distasteful to modern sensibilities, but it was simply part of the way things were done. Serving onboard a ship from a young age offered invaluable experience and hope of eventual advancement (it is mentioned that Jack started out at a very young age himself). The dynamics of the relationship between Jack and Stephen is at the center of the film (in fact it could be argued that the actual plot exists as little more than a vehicle for their characters), and Russell Crowe and Paul Bettany effectively project sharply contrasting personalities. Jack is a gung-ho, flamboyant warrior, given to excess of drink and fearless in battle, while Stephen is quiet, studious, and a little more sensitive. Crowe continues to demonstrate his ability and magnetism as an actor, bringing some of the same combination of authority, humanity, and ferocity that distinguished his Oscar-winning performance in Gladiator, and projecting the forceful presence and charisma that leads these men to follow ‘Lucky Jack’, but Bettany is a solid match in his less flashy role. They act well off each other, and the two very different men are well-drawn and ably-played. In the supporting cast, only Billy Boyd of The Lord of the Rings is a readily recognizable face, at least on this side of the Atlantic, but the rest of the actors have a feel of authenticity. James D’Arcy as the 1st Lieutenant, and Max Pirkis as a young midshipman who becomes Stephen’s pupil of sorts, are of note. All of the other actors are convincing, but there are by necessity no standouts. Acting-wise, the movie really belongs to Crowe and Bettany, with the others forming a solid background. Weir wisely doesn’t dilute his study of the Surprise’s crew with superfluous switches to the goings-on on the Acheron; the French are seen only from afar as distant, faceless enemies. We don’t need to know anything about them, this is not about them, or even at its core about the contest between the Surprise and the Acheron. 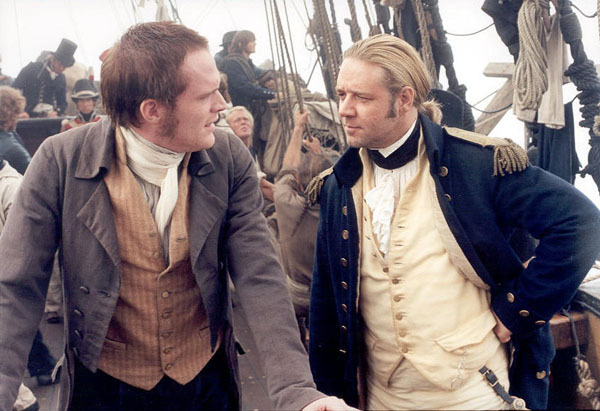 It’s about the Surprise and its crew, and really about the friendship, sometimes strained but always present, between Jack and Stephen, making Master and Commander really more of a character-driven drama than an action adventure, although it contains enough of the latter to satisfy most viewers. The running time ends up feeling a little padded. In particular the chunky middle section involving the unfortunate Hollom (Lee Ingleby), whom the crew becomes convinced is to blame for their ill luck, could have been excised for a more streamlined film, but it also exposes the uglier side of the crew, the superstitious side, with tensions and rivalries inevitably simmering between men cramped in tight proximity in a uncomfortable and monotonous situation for months on end, and how those tensions can quickly start to bubble and churn if allowed to fester. While both feature seafaring adventure, Master and Commander is as dissimilar to the likes of the hugely popular Pirates of the Caribbean trilogy as it can be centered around men on a ship on the high seas, and many of those who flock to Pirates will find Master and Commander too slow, with too much lengthy down time between the action. But for those with a historical interest in the oceanic warfare of the Napoleonic Wars, or of the ships of the time period, or simply of a solid seagoing adventure with strongly-drawn characters, this is one boat you should be onboard.